10.1 Chloride cycles, bypasses and purges. 11.1 Sulphates in the kiln. 12.1 Combustion chemistry and stoichiometry. Welcome to the Cemnet, cement kiln chemistry course, where we will provide an exploration of all the chemistry related issues connected with the cement kiln process. The course content is intended to be suitable for chemists, quality control personnel, process engineers and all technical staff employed by a cement manufacturing company and also the product development and technical sales staff of the suppliers of specialist products and services relating to all aspects of cement kiln operations. The aim is to cover theory and first principles in depth, together with an emphasis on the relevance of the theory to the every-day issues and problems arising when operating a cement kiln. The intention is for the course to be of practical use to the people operating cement factories on a day-to-day basis. During the course we will try to provide answers to all the cement kiln process chemistry questions which have arisen during more than 30 years operation of cement kilns. Burnability and combinability of kiln feed and clinker. These topics will be covered in 10 sessions (including this one) and will be published over the first 2 weeks of the course. These topics will again be covered in 10 sessions published over the middle two weeks of the course. Acid gases, NOx and SOx. Module 3 will be published during the final 2 weeks of the 6 week course. Alternative fuels and raw materials. Tightening emissions regulation and emissions trading. Efficient, modern cement kilns achieve thermal energy consumption of less than 3000 kJ/kg of clinker produced. Higher thermal energy consumption of a cement kiln almost inevitably leads to lower clinker productivity. With higher fuel consumption the volume of exhaust gases to be vented from the kiln rises. Thermal load on the refractories in the kiln increases. The quantity of fuel which must be delivered to the kiln, per unit of clinker production, rises. This link between thermal energy consumption and kiln productivity is the reason these topics are considered together in module 1 of the course. These kilns are equipped with 5-stage preheaters, precalciners and direct aerated coolers. Addition of a 6th preheater stage can reduce this thermal energy consumption to less than 2900 kJ/kg clinker, but this increases capital cost and the resistance to drawing the exhaust gases out of the kiln. 5 preheater stages is currently considered the optimum, unless special circumstances dictate more or less stages. for exhaust gas conditioning in desert climates may dictate the inclusion of a 6th preheater stage. Development of a mass and energy balance of these modern, efficient kilns, reveals that only 1735 kJ/kg clinker (415 kcal/kg) is consumed by the chemical reactions involved in the conversion of the kiln feed into clinker. The remainder of the thermal energy input to the kiln is lost from the system as latent heat in the clinker and dust, in the preheater and cooler exhaust gases, and as radiation and convection from the kiln shell. kcal/kg). Why is that? The reasons for this variation in the heat of conversion of cement raw mix to clinker, otherwise known as burnability, will be explored in the first sessions of this module. The precalciners of these modern cement kilns operate at temperatures ranging from 855~915°C. Why does the temperature stabilise? And why does the temperature vary from kiln to kiln and factory to factory? Again the reasons for the performance of precalciners will be explored in the early sessions of the module. The clinker combination temperature and burning zone of some cement kilns have to be much hotter than other kilns. Why is this? The litre weight of the clinker produced varies from time to time and kiln to kiln. The grindability of the clinker produced from the kilns also varies from time to time and kiln to kiln, along with the litre weight. Again the reasons are explored in the middle sessions of this module. 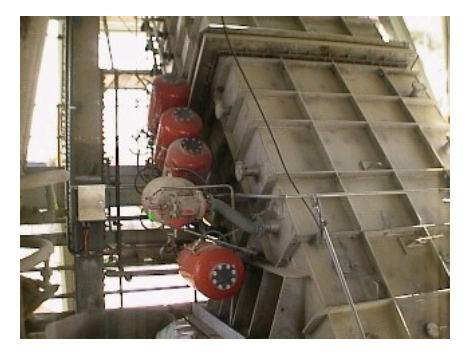 Some trace components of the feed and fuel to the kiln recirculate within the kiln concentrating in the hot meal exiting the preheater to the rotary kiln. The mechanism of this alkali cycle is discussed, and the interactions between the gaseous, liquid and solid minerals in the hot meal. Which intermediate compounds are formed during the conversion from kiln feed to clinker? And how do these impact on the efficiency and productivity of the kiln? … by dusting, ring and snowball formation? How and why do snowmen form in coolers? And how to prevent their formation? In module 1 the implications on the clinker quality and kiln emissions, of the chemical and physical changes taking place in the kiln will not be covered. These equally important considerations will be covered in modules 2 and 3 of the course. However, the linkages between kiln thermal energy efficiency, productivity, clinker quality and emissions will be highlighted. The kiln operation needs to be optimised to minimise thermal energy consumption and emissions, while maximising clinker quality and kiln productivity. No easy task, and the reason to be following this course! 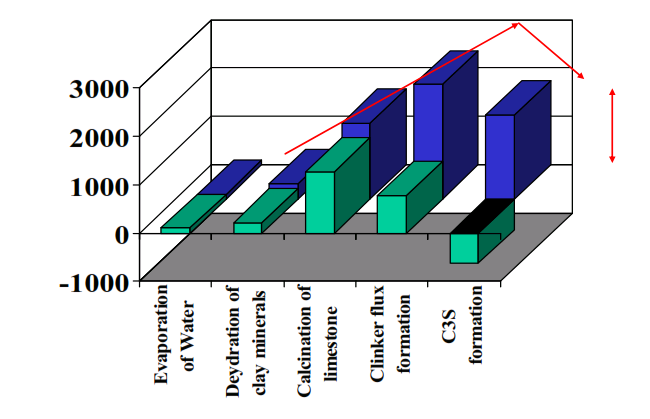 The final combination of the C3S significantly reduces the overall energy required for cement clinker formation. 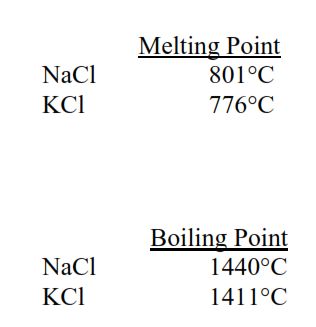 The aggregate of these individual heats of reaction varies from 1630~1840 kJ/kg clinker. Of course, this equation does not provide an estimate of the energy consumption of clinker formation, rather it provides a prediction of the relative “burnability” of a kiln feed, i.e. the residual free lime after heating to 1400°C under controlled conditions. However, F.L. Smidth have developed a method of predicting the energy of clinker formation based on “first principles”. This method is based on the average thermodynamic values of well characterised, common minerals. 1- First all the raw minerals are decomposed (oxidised) to pure oxides in their most stable state at 25°C, and gaseous products such as CO2 and H2O. 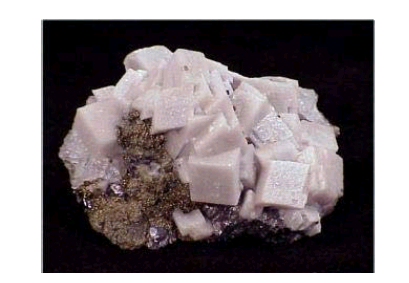 2- Then the pure oxides are combined to form the clinker minerals, alite, belite, etc, and minor constituents of clinker such as MgO and mixed alkali-calcium sulphates. %CaCO = %CaO * 100.08/56.08. %Excess CO2/44 to %MgO/40.3 0.0273% to 0.0274% in this case. These calculations yield a mineral composition for the CaO and MgO in the raw mix. Cement companies invest a significant amount of capital and effort to reduce or minimise the range of variation of their kiln feed. Characterisation of raw material deposits by geological surveys and core drilling. Taking the correct proportions of the different materials through a common or separate crushers. Clinker quality control and minimising variation in quality are a major justification for these efforts. However, it is difficult to quantify the quality benefits which these efforts deliver. The FLS methodology for determining heat of clinker formation provides a method of quantifying the benefits in terms of kiln thermal energy consumption. In my example clinker the heat of formation was calculated to be 1735 kJ/kg clinker. At least 40% of the thermal energy consumption of a cement kiln is consumed by the losses from the kiln, in the preheater exhaust, cooler excess air, the hot clinker and the radiation from the shell of the preheater, kiln and cooler. If in my example the kiln feed LSF was 1% higher then the heat of clinker formation is calculated to rise by 15 kJ/kg clinker to 1750 kJ/kg clinker. As a cement kiln is at best 60% thermally efficient this must be multiplied by 1.67 to estimate the impact on kiln thermal energy consumption. I.e. an increase in thermal energy consumption of 26 kJ/kg clinker. Returning to the principles of statistical process control this tells us that the results for kiln feed LSF will be normally distributed about the target over time. Based on our previous calculations a 1% increase in LSF will lead to a rise in thermal energy consumption of 26 kJ/kg clinker. If the standard deviation is 1% in LSF then the normal range will be +/-3%, and thermal energy consumption may rise by 78 kJ/kg clinker at the maximum. Of course as the kiln feed LSF results are normally distributed the high results will be balanced by low results. Therefore it might be expected that the kiln thermal energy consumption will be centred about the mean which corresponds with the target LSF. However, kiln burning zone temperature, and therefore thermal energy consumption, is one of a number of examples in cement manufacturing where the minimum is the key control rather than the target. In my example with a standard deviation of 1% this equates to 78 kJ/kg clinker. Reducing the cost of that additional energy is the value of the investments made to reduce kiln feed variability by proportioning, mixing and analysing the raw materials and kiln feed – a significant on-going manufacturing cost. In the preceding session we saw that thermodynamics alone cannot explain the differences in burnability of cement raw mixes and thermal energy efficiency of cement kilns. It is also important to consider the kinetics of the individual reactions taking place in the different sections of the kiln. How quickly will the reactions take place?…Will the reactions be completed in the appropriate sections of the kiln? In the preceding section we learned that CaCO3 calcination is the reaction which consumes the most energy in the decomposition of the raw minerals in the kiln feed. In this session we will further explore the CaCO3 calcination reaction and its kinetics. All the raw minerals in the cement kiln feed raw mix will dissociate below 1000°C. In a pure CO2 atmosphere CaCO3 starts to dissociate at 900°C, at lower CO2 partial pressure the dissociation of CaCO3 starts at a lower temperature. Therefore, the calcination in a separate line calciner would be expected to commence at a lower temperature than in an in-line calciner. An in-line calciner is swept with vitiated gases from the kiln containing the CO2 and H2O combustion products from the main burner, and therefore the partial pressure of CO2 is higher. A separate line calciner is swept with pure tertiary air containing virtually no CO2. The calcination in kilns fired with natural gas might be at a lower temperature than those fired with coal or oil as the natural gas produces less CO2 in the combustion products when burnt. The fineness and crystal structure of the CaCO3 are also important determinants of CaCO3 reaction temperature and velocity. A finer ground raw mix is likely to begin to calcine at a lower temperature, and complete its calcination more quickly. A highly crystalline marble or calcite is likely to calcine at a higher temperature than a limestone or marl. However, the most important determinant of the CaCO3 reaction temperature and velocity are the reactions which take place with the decomposing acidic components of the kiln feed (the SiO2, Al2O3, Fe2O3) and the reactivity of the acidic minerals. Clay minerals start to decompose at ~500°C+, producing highly reactive, finely divided SiO2 and Al2O3. These react with CaCO3 to produce calcium silicates, aluminates and ferrites at well below the dissociation temperature of CaCO3. No CaO is produced until the temperature exceeds 850°C, all the CaO from the dissociation of CaCO3 below this temperature reacts with the acidic SiO2, Al2O3 and Fe2O3 to produce low lime silicates and aluminates. Quartz is more crystalline and breaks down more slowly to produce silicic acid which then reacts with the CaCO3 to produce low lime silicates. Particle size of the quartz is the critical factor, explaining the importance of the granulometry of the kiln feed. In natural clays any quartz grains can vary in size affecting the reactivity of the clay. If silica sand is added to boost the silica modulus, then this will concentrate in the coarse fraction of the ground mix due to the low grindability of quartz compared with limestone, exacerbating the low reactivity of the quartz. 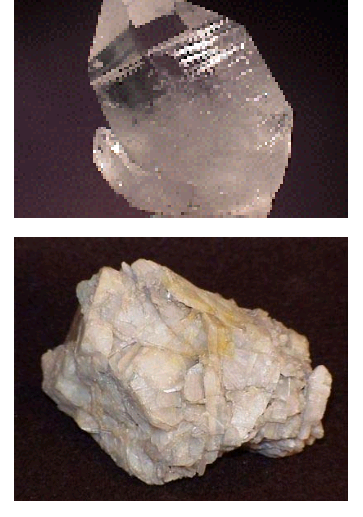 Some siliceous minerals have intermediate reactivity between the clay minerals and quartz sand, i.e. chalcedony, opal, mica, feldspars and glasses. The origin of the Al2O3 and Fe2O3 also affects the reactivity of the kiln feed. Al2O3 and Fe2O3 derived from the clay minerals are more reactive than when derived from the hydroxides, bauxite and laterite. The hydroxides, bauxite and laterite, dissociate below 500°C, which is too low a temperature to react with CaCO3. The Al2O3 and Fe2O3 produced, therefore recrystallise and stabilise before reacting with CaCO3. The effects of the rate of heating are complex, with the conduction of heat into the centre of the particles sometimes being a deciding factor. If the surface of the particles is at the CaCO3 dissociation temperature, but not the centre then, the outer layers may calcine. 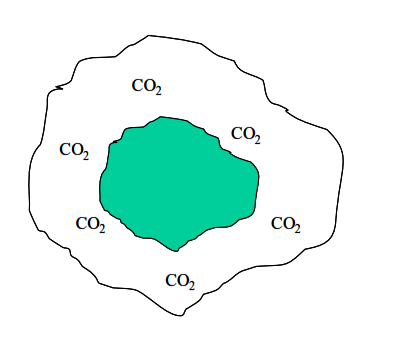 The partial pressure of CO2 in the outer layers of the particle is then raised inhibiting calcination of the centre. Finer grinding helps to allevatiate these potential problems. On long kilns this can be the reason for slower kiln speed assisting in the combination of the clinker. However, with preheater, and particularly precalciner kilns, slowing the kiln speed is generally detrimental to energy efficiency and productivity. Once the CaCO3 has been calcined very rapid heating from the calcination temperature of 850~900°C is beneficial. The newly liberated CaO does not then have time to recrystallise before reacting with SiO2 to increase the lime content of the silicate minerals. The CaO contains many lattice defects and voids and is highly reactive towards the acidic minerals in the kiln. This is one of the principal benefits put forward for short, two-support rotary kilns. The CaO formed in the precalciner is transported as quickly as possible to the burning zone due to the short length of the kiln and therefore remains highly reactive. This is also the explanation for the benefits of high kiln rotational speed of 3.5 rpm+, particularly with precalciner kilns. sufficient time for the sintering reactions. In that case finer grinding of the kiln feed, or the use of mineralisers might be a solution, we will consider mineralization a little later. Besides the clay minerals other potential raw mix components can accelerate the dissociation velocity of CaCO3. Alkali salts precipitating on the surface of the CaCO3 will accelerate the dissociation – the reactions of the alkalis in the cement kiln will be the major topic of the second part of this module. 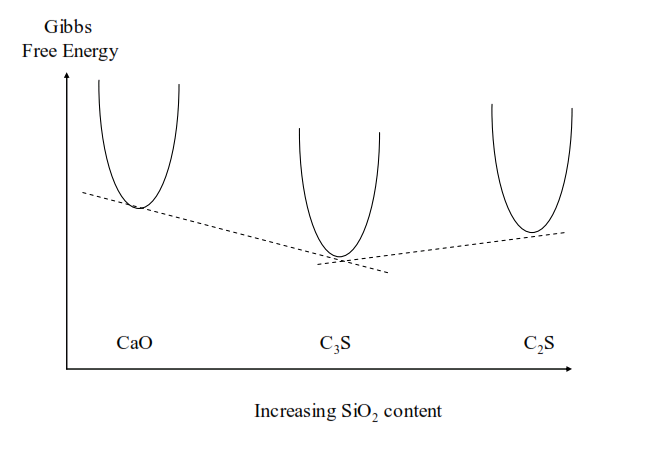 Sodium silicofluoride, basalt, lead and copper slags, apatite and phosphorous slag will all reduce the activation energy of CaCO3 dissociation, leading to increased kiln output due to accelerated CaCO3 calcination. All these effects on the calcination reaction kinetics. CO2 partial pressure, kiln feed granulometry, CaCO3 crystallinity and acidic mineral reactivity affect the temperature at which CaCO3 dissociation takes place and the operating temperature of a precalciner. CaCO3 dissociation takes place from ~550°C by reaction of the liberated SiO2 and Al2O3 from the clay minerals. However, only at higher temperatures does the rate of dissociation increase sufficiently for the temperature to stabilise as the endothermic calcination reaction absorbs the heat energy in the precalciner. After completion of the dissociation of the CaCO3 the sintering reactions are the next stage of the formation of cement clinker, these will be the topic of the next session of the course. However, we cannot leave the reactions taking place in the preheater without discussing the phenomena of recarbonation. The cyclones in a cement kiln preheater do not have 100% collection efficiency. Some of the feed entering the cyclone is not collected and passes out of the cyclone, up the preheater tower with the exhaust gas. The cyclones at the bottom of the preheater tower may have collection efficiencies of 85% or lower, meaning that there is a considerable recirculating load of material in the preheater. The CaO in the calcined material in the lower stage cyclones can recarbonate in the higher stages of the preheater. This liberates exothermic energy in the higher stages of the preheater. Thermodynamically this does not affect the overall heat of clinker formation- the same amount of energy is liberated by the recarbonation as is consumed by the calcination. However, recarbonation can significantly reduce the thermal energy efficiency and productivity of a cement kiln. In a similar fashion to pyrites and organic carbon in the kiln feed the effect is to increase the temperatures higher up the preheater. Preheater exhaust gas temperatures rise and with them energy losses and the thermal energy consumption of the kiln. F.L. Smidth’s models of cement kilns suggest that each 1% increase in recarbonation in the preheater results in ~ 2 kJ/kg clinker increased thermal energy consumption and a ~1°C rise in preheater exhaust gas temperature. Low efficiency of the lower stage cyclones in the preheater is a common root cause for higher fuel consumption and low productivity of cement kilns. In the next session of the course we will cover the sintering reactions undergone by the CaO liberated from the CaCO3 in the calcination reactions. In the preceding session we saw that once the CaO has been liberated from the CaCO3 by the calcination reaction, rapid heating is beneficial to prevent crystallisation and attendant stabilisation of the CaO. The CaO reacts with the acidic components of the decomposing clay minerals to form C2S and low lime aluminates and ferrites. Evidence has been found of the transient formation of the ternary compound, gehlenite, C2AS, from ~900°C, but this is all converted to C2S and calcium aluminates as the temperature rises to 1100°C and beyond. transition compound, and has been associated with ring formation in the calcining zone of long kilns. This is unlikely to be present in rings in precalciner kilns as little CaCO3 remains when the material enters the rotary section of the kiln. Calcium monoaluminate, CA, is the first aluminate to form and C12A7 has been reported as a transient compound between 900~1100°C. These lower lime aluminates do not convert to C3A until the temperature exceeds 1100°C. Dicalcium ferrite, C2F, is the first CaO-Fe2O3 compound to form from ~800°C, with formation of C4AF taking place in the temperature range 1100~1250°C. is predominantly to the left. If C3S is annealed at temperatures below 1250°C it will decompose to C2S and CaO. 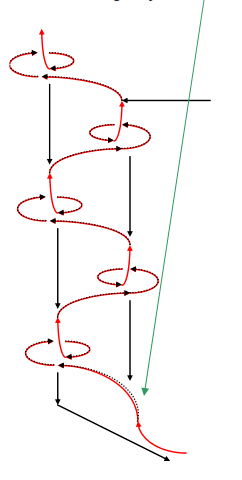 Above 1250°C the equilibrium shifts to the right to favour the formation of C3S, with the formation of a liquid phase significantly increasing the rate of reaction to form C3S. As the low lime aluminates, CA and C12A7, are not converted to the higher lime C3A until the temperature exceeds 1100°C, and the higher lime silicate, C3S, is not formed until the temperature exceeds 1250°C and first melting occurs, there is a considerable excess of CaO over that which can be combined in the temperature range 900~1250°C. This is the CaO whose stabilisation must be avoided by rapid heating. The reaction between C2S and CaO to form C3S is referred to as a “sintering” reaction because the reactants, C2S and CaO, and the reaction product, C3S, are all solids at the temperatures attained in a cement kiln. Never-the-less the formation of a liquid phase above 1250°C, as the C4AF and C3A clinker minerals melt, plays a vital role in accelerating the solid-state reactions between C2S and CaO to form C3S. 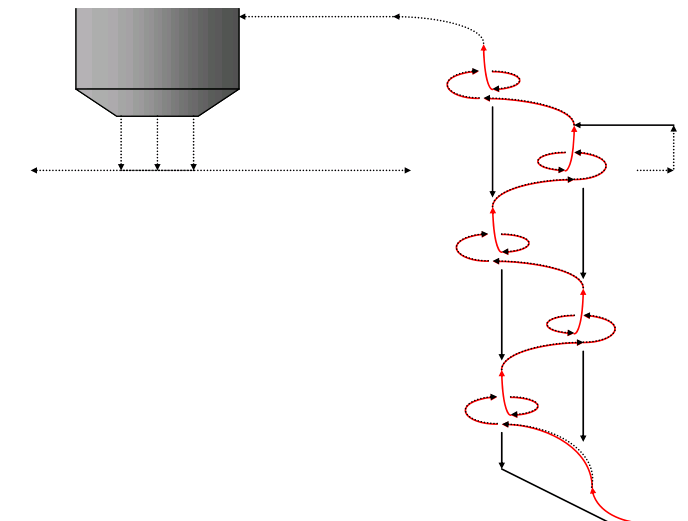 The formation of the liquid “fluxes” sintering reaction to form C3S. While the C2S and CaO reactants and the C3S product are solids, they each dissolve to some extent in the liquid. 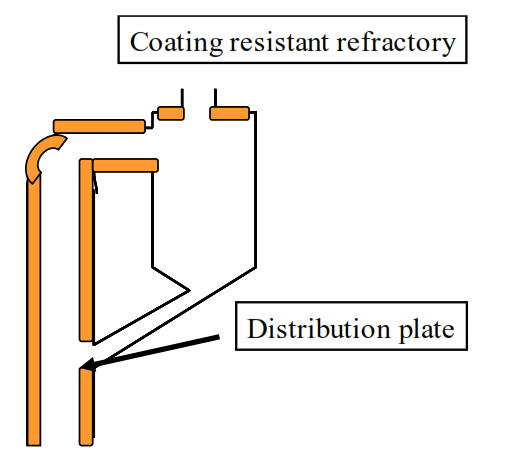 The reaction proceeds towards the phase equilibrium between the reactants and product in both the solid and liquid phases at the temperature at the particular position in the kiln. The liquid flux plays a vital transport role in dissolving and bringing together the solid reactants to allow the solid product to be formed and crystallise from the melt. 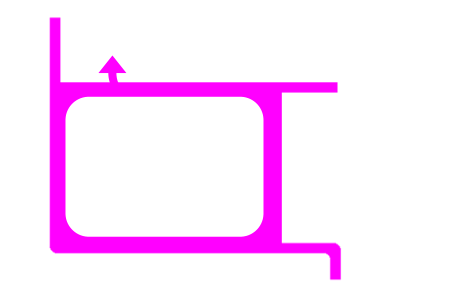 The effectiveness of the liquid flux in accelerating the reaction between C2S and CaO to form C3S depends on: (i) the amount of liquid at a given temperature, (ii) the viscosity of the liquid and (iii) the surface tension of the liquid. 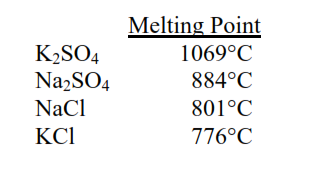 In the quaternary CaO-SiO2-Al2O3-Fe2O3 (CSAF) system the minimum eutectic temperature, when melting will take place and liquid be formed, is at 1338°C. In the presence of MgO and the alkalis, Na2O and K2O, as is the case in an industrial raw mix, the minimum eutectic temperature, when melting will take place and liquid be formed, is at 1280°C. The amount of liquid then increases as the temperature rises and more of the minerals melt. 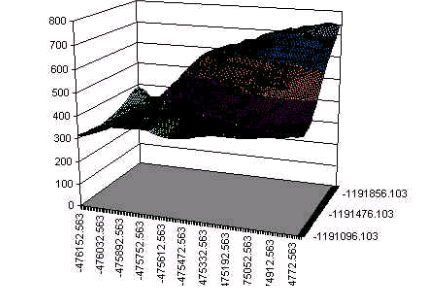 Using these formulae the rate of flux formation as temperature increases can be calculated and plotted. The contribution of MgO to the flux is limited to 2%, as this is limit of solution of MgO in the flux. This then leads to the concept of the “clinkering range” of a particular mix, or clinker composition. The “clinkering range” is the temperature range starting from the temperature when sufficient liquid is formed to cause shrinkage and nodule formation, and ending when so much liquid is formed that serious balling of the mix takes place. Mixes or clinkers with a wide “clinkering range” create less operational problems such a ball or ring formation, than those with a narrow “clinkering range”. High Fe2O3 mixes tend to have a narrower clinkering range. With a narrow “clinkering range” any fluctuations in temperature can cause ball or ring formation to occur. Fluctuations in temperature are inevitable with an industrial cement kiln, as we have seen from SPC considerations. Unfortunately it is not possible to define the exact “clinkering range” for a particular mix or kiln. The minimum flux content for shrinkage and nodule formation and the maximum flux content to avoid ball and ring formation are also dependent on the viscosity and surface tension of the liquid flux. 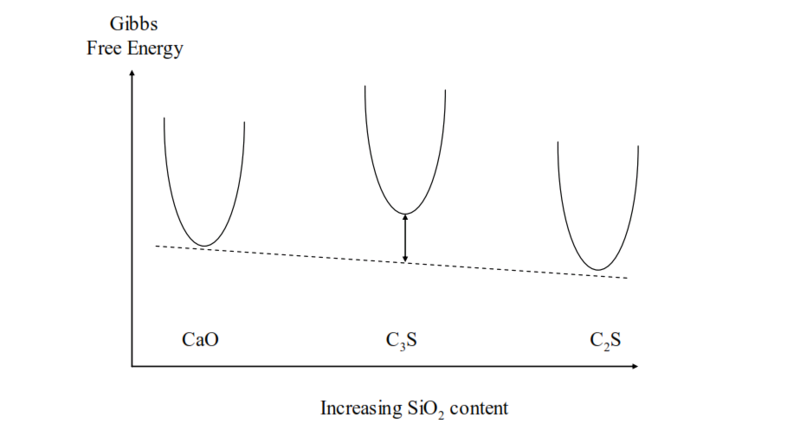 As the formulae for the calculation of the flux content at different temperatures are based on the Al2O3, Fe2O3, MgO, Na2O and K2O content of the clinker the ratio of the CaO to SiO2 has no affect on the amount of flux or the “clinkering range”. However, the total CaO and SiO2 content clearly affects the amount of Al2O3 and Fe2O3 which can be present in the remainder, as silica modulus (SM) rises the amount of Al2O3 and Fe2O3 falls, and therefore the amount of flux that will be formed. When SM exceeds 4 the rate of the sintering reactions generally becomes too slow for clinker production at the temperatures that can be attained in industrial cement kilns. Exceptionally siliceous limestones with very small quartz grains might allow sintering of raw mixes with SM as high as 12. The amount of flux is also boosted by the amount of MgO, Na2O and K2O present in the mix or clinker, leading to the possibility to boost the flux content and promote sintering by adding fluxing agents to the mix. 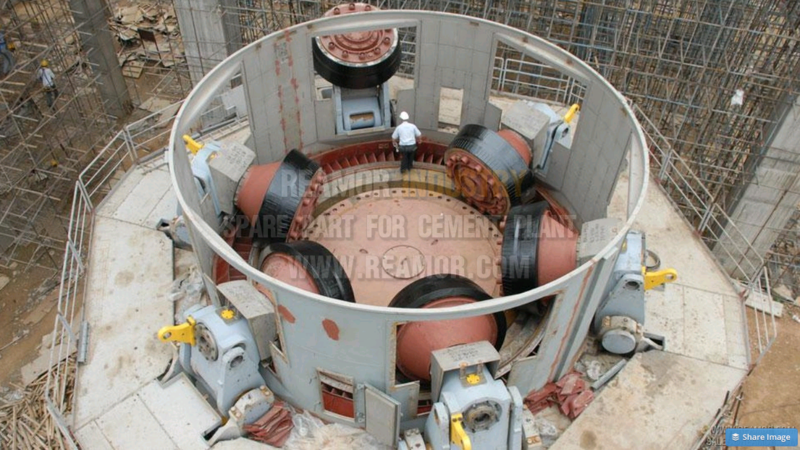 MgO and alkali bearing materials are not good options as they can lead to concrete durability problems when the cement produced from the clinker is used in some applications. Alkalis also increase the viscosity of the flux and thereby inhibit the C3S formation reaction. The additions which generate the most interest are fluorides, either as calcium fluoride, CaF2, or silicofluorides in combination with sodium, potassium, magnesium or calcium, CaSiF6. The fluoride anions reduce the viscosity of the flux and promote the formation of C3S. However, the principle role of fluoride additions is to mineralise the sintering reactions in a cement kiln. Mineralising additions to the raw mix promote the sintering reactions by reducing the temperature at which the combination of C2S and CaO to form C3S takes place, fluorides are the most common mineralisers used in this way. This is the topic for the next session of the course. with the formation of a liquid phase significantly increasing the rate of reaction to form C3S, how can that be explained? The explanation relies on consideration of free energies and chemical potentials of the reactants and products at different temperatures. Below 1250°C the Gibbs free energy (chemical potential) of C3S is higher than free CaO or C2S and therefore C3S will not be formed from an intimate mixture of CaO and C2S because it is unstable. CaO and C2S are stable, and C3S unstable. Above 1250°C the Gibbs free energy (chemical potential) of C3S is lower than free CaO or C2S and therefore C3S is the most stable compound and will be formed. Dependent on the SiO2 content, either CaO and C3S are stable, or C3S and C2S are stable. Returning to the chemical potentials below 1250°C, the free energy of any compound can be reduced by incorporation of minor substitutions or impurities. Most common impurities, Na2O, K2O, SO3, Al2O3, are incorporated in the belite, C2S. 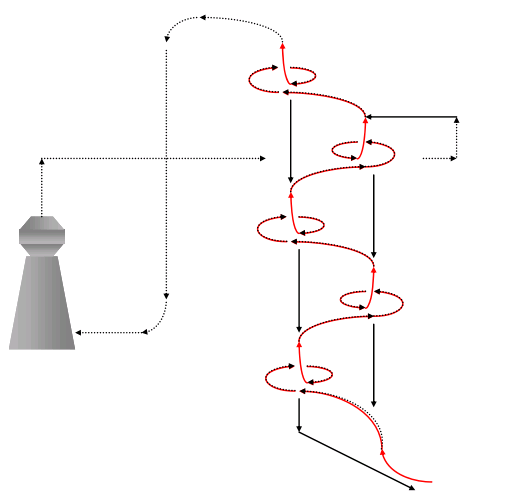 Free energy of the C2S is reduced, C2S is stabilized and formation of C3S becomes more difficult. Na2O, K2O, SO3 and Al2O3 inhibit the formation of C3S. Mineralisation is sometimes thought to be synonymous with the production of mineralised clinker, as practiced at Aalborg in Denmark, and promoted by FL Smidth. This does involve the addition of fluoride to the kiln feed, but also in combination with sulphate, SO3, an inhibitor, the principle aims relate to clinker and cement quality. We will return to the subject of the quality related benefits of mineralised clinker in module 2 of the course, in module 1 we are focusing on the impact on kiln energy efficiency and productivity. SO3 is an inhibitor, but it is also a fluxing agent, SO3 forms low temperature melts from ~1100°C. Clinker mineral formation takes place through the medium of this SO3 melt. The SO3 also reduces the viscosity of the C4AF and C3A melt when it forms, however, this low temperature flux is not useful in the absence of fluoride, C3S is not stable at those temperatures in the absence of fluoride. In the presence of fluoride the combined mineralisation effect of fluoride, and fluxing effect of SO3 more than overcome the inhibiting effect of SO3. 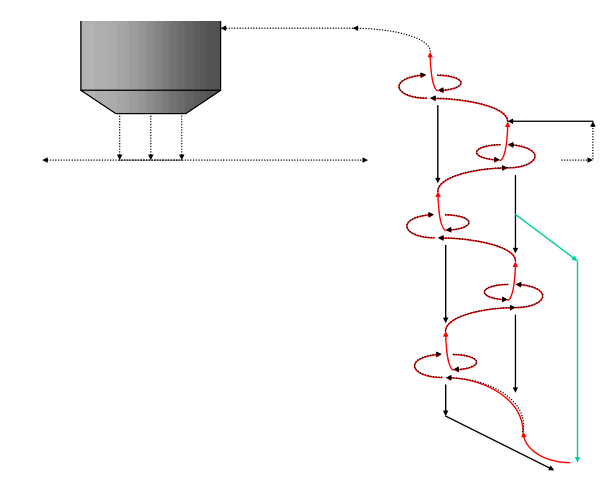 Mineralisation of the raw mix fed to a cement kiln is not entirely straight-forward. Aalborg’s technology and patent derive from a patent first taken out by Blue Circle in the 1970s. In part Blue Circle’s discoveries arose for experience at their Hope Works in the UK where fluoride, as CaF2 in limestone, and sulphur, as pyrites, FeS2, in shale, were present in the raw materials. Trials with mineralised kiln feed were carried out on long wet, Lepol and suspension preheater kilns, with severe blockages of the preheater of the suspension preheater kiln. This increased “stickiness” of the hot feed in the preheater is often reported when mineralisation is introduced. Mineralisation with fluoride will stabilise C3S and promote its formation from CaO and C2S at 1170°C. In practice ~1350°C is required to overcome the inhomogeneities in the kiln feed we have already discussed. Never-the-less this represents a reduction in the combination temperature of 125~150°C. The kiln burning zone temperature must be reduced in response to this lower combination temperature requirement, if not the additional thermal energy input, over-and-above that required for clinker combination, will be absorbed to volatilise alkalis and sulphates from the kiln charge and a heavy alkali cycle will develop, leading to the hot meal “stickiness” and preheater blockages. Kiln operators will need support and coaching to make the necessary reductions in burning zone temperature. Provided the kiln burning zone temperature is lowered by this amount the thermal energy requirement is significantly reduced, and therefore, the amount of fuel which must be burnt per tonne of clinker produced. Kiln exhaust gas volume is reduced and exhaust fan capacity released to allow kiln output to be increased. Thermal load on the burning zone refractories is also significantly reduced, longer kiln campaigns between refractory replacement should follow, or less expensive refractories will be required to the desired length of kiln campaign. The lower temperature in the burning zone can cut NOx levels at the kiln inlet to 40% of those prior to mineralization. We are going to spend a couple of sessions talking about NOx generation and emissions mitigation in Module 3. Kiln feed mineralisation is one means to achieve this, along with better quality clinker, lower fuel consumption and more output. CO2 emissions will also be reduced as a consequence of the lower fuel consumption, one of the few win-win-win-win options provided by cement kiln chemistry! F.L. Smidth promote the production of mineralised clinker and have developed methodologies to overcome the difficulties which can arise. The first requirement is to install the equipment to dose the fluoride and sulphate needed for the production of mineralised clinker. This might simply be additional feed bins and weigh feeders to dose the fluoride mineral and gypsum into the raw mill. If the additional sulphur is to be provided by a high sulphur fuel, such as petroleum coke, then there are modifications to solid fuel grinding circuits, precalciners and main burners that may be required, that is a technology in itself and not specifically related to mineralisation. As discussed a couple of sessions ago mineralisation might the solution if the kiln feed is particularly hard to burn, allowing rotational speed to be increased and kiln output to be boosted, or if a two support, short rotary kiln does not provide sufficient residence time for the sintering reactions to be completed. As previously stated the burning zone temperature must be reduced to prevent the volatilisation of alkalis. Sulphate volatilisation is particularly to be avoided with the Aalborg technology as sulphur loads in the kiln are boosted as part of the technology. The main burner of the kiln may require modification to avoid these problems. These issues of volatile cycles in the kiln will be the topic of the next sessions of the course. In the preceding sessions of the course we have been focusing on the reactions of the major oxides, CaO, SiO2, Al2O3 and Fe2O3 to form the clinker minerals C3S, C2S, C3A and C4AF. We have seen that minor components such as MgO, K2O, Na2O, SO3 and F- affect the heat of clinker formation, amount of flux formed at different temperatures in the kiln, properties of that flux and can inhibit or mineralise clinker formation. In this module 1 we are concerned with the thermal energy efficiency and productivity of the cement kiln. The reliability of the kiln operation has a major role to play in determining this thermal energy efficiency and productivity. Every time the kiln stops the heat capacity must be re-established to reach the temperatures required for C3S formation. Unplanned kiln stops can arise for many reasons, mechanical or electrical equipment failures, mistakes in operations, these are not our concern in this course, we are focusing on the process chemistry and its potential effects on the reliability of kiln operations. Every time the kiln stops the heat capacity must be re-established to reach the temperatures required for C3S formation, the behaviour of the minor components in the kiln feed (and fuels) have more affect on the reliability of kiln operations than do the major oxides. In particular the recirculation of volatile species which is known as the alkali cycle. The volatile species that participate in these alkali cycles are the carbonates, sulphates and chlorides of the alkali metals, K+ and Na+. The alkali metals are introduced into the kiln with the clay minerals where they occupy positions between the alumino-silicate layers. They may also be present as alkali carbonates, or carbonates may be formed in the preheater, sulphates or sulphur can be introduced in the raw materials or fuels, chlorides may also be introduced in the raw materials or fuels, and can also be introduced as salt, NaCl, in the process water introduced in conditioning towers etc. The alkali cycle transfers thermal energy from the burning zone to the preheater, in a similar way to recarbonation transferring thermal energy up the preheater, or combustible materials in the feed. The thermal energy from the burning zone transferred back to the preheater is not used efficiently and increases preheater exhaust gas temperature and increases overall thermal energy consumption. 1- Steps can be taken to reduce the intensity of the volatile cycles. These strategies depend to a great extent on the volatile species that are building up in the alkali cycle. We will consider these factors in the next two sessions of the course. 2- Steps can be taken to prevent the material sticking to the ducts in the preheater. 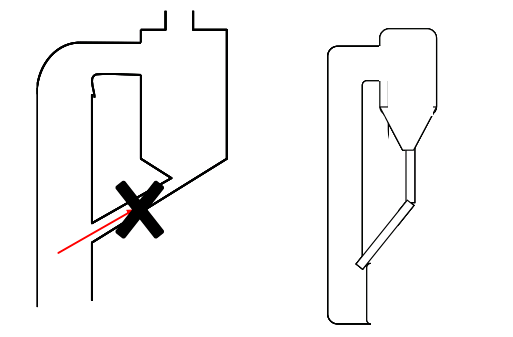 Meal distribution plates in the preheater ensure that the feed is evenly distributed through the rising gas stream in the preheater, promoting condensation of volatiles on the descending feed rather than the duct walls, also cooling the rising gases and preventing volatiles migrating higher up the preheater. The gas riser from the kiln inlet and the ducts in the lower part of the preheater can be lined with coating resistant refractories. Air cannons can be fitted to prevent coating forming in known areas of problems. Local knowledge of the particular kiln is critical to correctly siting the air cannons. Air cannons must fire in the direction of material flow, rather than opposing the material flow. Air cannons have limited range of no more than 1.5m and therefore multiple cannons are likely to be needed. Acoustic horns are an alternative to air cannons. Dead areas with low gas velocity need to be avoided to prevent accumulation of “sticky” dust. Feed flaps need to be fitted to cyclone exit chutes to prevent gas short-circuiting up into the cyclones and preventing free flow of the material out of the cyclones. Angle of incline of cyclone exit chutes need to be at least 55° to ensure feed falls rapidly through the chutes. affects the properties of the flux and the “clinkering range” of the hot meal in the kiln. This can be the cause of ball and ring formation in the kiln, which can again lead to unplanned stops of the kiln, again, more of this in succeeding sessions. 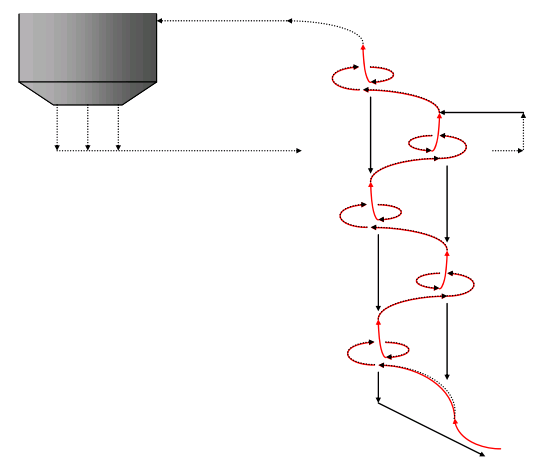 This cycle between the rotary kiln and the preheater is the classical “internal” alkali cycle. There is also an “external” alkali cycle, which must be considered. 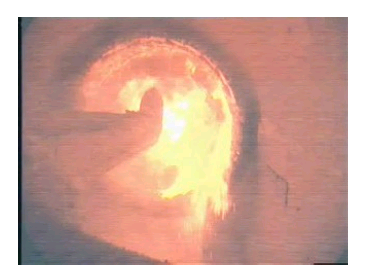 The volatilised fumes exit the rotary kiln to the preheater together with the combustion product gases from the main burner, and encounter the feed descending the preheater. The volatilised fumes condense and are collected in the cyclone where the temperature is below the melting point of the volatile species. Chlorides will condense higher up the preheater than sulphates. We have already seen in session 1.3 that the preheater cyclones do not have 100% collection efficiency, the lower cyclones may only have 80~85% collection efficiency. Some of the volatile species are therefore carried up the preheater with the uncollected feed, and some exits the top cyclone in the dust. There is therefore an “external” cycle between the preheater and the precipitator in the dust. Some components, such as sulphides, in the kiln feed will oxidise in the upper stages of the preheater, and are lost as gases (SO2) in the preheater exhaust gas. Some will be absorbed onto the raw mix in the raw mill and is returned to the kiln in the kiln feed. Another external cycle between the preheater and the raw mill. Other highly volatile species, such as ammonium compounds, will evaporate in the upper stages of the preheater and be partially absorbed in the raw mill. Yet another external cycle between the preheater and the raw mill. We are going to return to these external cycles in Module 3 when we consider emissions from cement kilns. The melting points of volatile species we introduced earlier are of the discrete species. In practice there will be a mixture of these volatile species salts in the hot meal, softening and melting points may be even lower due to the formation of low temperature eutectics between the salts. We will talk about the cycles of the individual species and the mixtures in the next sessions of the course. Chloride cycles, bypasses and purges. In the preceding session we talked about the general principles of the alkali cycles, in this session we will consider the cycles of chlorides in the cement kiln. When mixed with sulphates, K2SO4, Na2SO4, CaSO4, low temperature eutectic melting takes place below 700°C. These boiling points of the alkali chlorides are lower than the burning zone temperature of a cement kiln. It is therefore very difficult for any chloride to pass through the kiln and exit in the clinker. Chloride volatility in a cement kiln is very high and the concentration in the hot meal can be ~100x that in the feed and fuel inputs to the kiln. 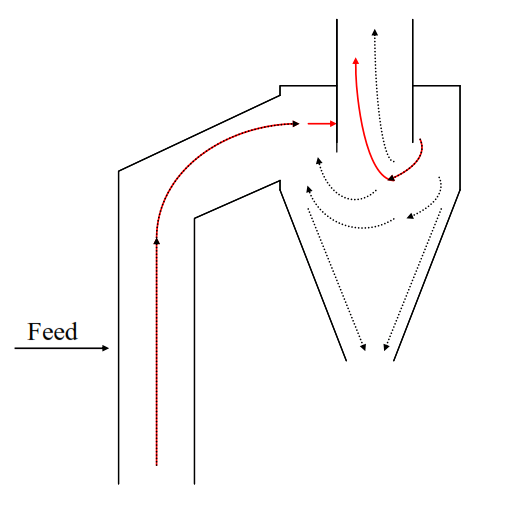 In a closed system the outputs in clinker must equal the inputs in the feed and fuel. If the inputs exceed 0.02% per kg clinker then the concentration in hot meal is likely to exceed 2% (loss free), preheater blockage problems are likely at this Cl concentration in hot meal. If the chloride inputs exceed 0.02% then some way is required to break the cycle of chlorides. One solution to this chloride cycle problem can be the installation of an alkali bypass or bleed. The effectiveness of alkali bleeds or bypasses is closely connected with the cycle itself. The concentration in the recirculating material reduces, and with it, the tendency for the preheater to block. The concentration factor of recirculating volatile material is the ratio of the quantity in the hot meal to the quantities entering the kiln in the feed and the fuel. Concentration factor is directly related to the volatility of the recirculating species in the burning zone. Alkali bypasses are effective for highly volatile materials which have high concentration factors. Chlorides have a very high volatility in the burning zone (>97%), and therefore high concentration factors. Alkali bypasses are very effective in reducing the cycle of chlorides, and alleviating chloride based clogging of the preheater. If the raw materials and/or fuel have chloride content in excess of 0.03% on clinker an alkali bypass will be required to allow the kiln to operate without preheater clogging problems. When alternative fuels are burnt in a cement kiln, installation of an alkali bypass can be necessary to alleviate chloride based preheater clogging problems. When a bypass is installed on a cement kiln the volatility of the potassium, K+, and sodium, Na+, in the feed can be increased by the addition of chloride to the feed as calcium chloride, CaCl2. Potassium and sodium will preferentially combine with chloride in the hot meal of the kiln and their volatility will be boosted by the volatility of the chloride. This means that a bypass can be used to produce low alkali clinker from high alkali raw materials if calcium chloride is added to the kiln feed. The precalciner kiln process particularly lends itself to the installation and operation of an alkali bypass. Less than 50% of the fuel is fired in the main burner of the kiln and the feed is virtually fully calcined by the time it enters the rotary section of the kiln. Alkalis volatilised in the rotary kiln are therefore concentrated in the lower volume of kiln exit exhaust gases, therefore a lower percentage of the kiln exit gases have to be bypassed to break the chloride cycle. The operation of an alkali bypass needs to be optimised to minimise the amount of dust drawn out of the kiln exit with the bypassed gas. 1 gram of dust per kilogram of clinker produced per percent of bypassed gas should be possible by correct siting of the bypass take-off. Disposing of the bypassed dust can be a major problem, therefore the less drawn out of the kiln the better. Drawing kiln exit gases out of the kiln at 1000°C+, and then quenching those gases inevitably imposes a thermal energy penalty on the process. Each percent of bypass means ~20 kJ/kg clinker increased fuel consumption on a preheater kiln or 10 kJ/kg clinker per percent of bypass on a precalciner kiln as the volume of hot kiln inlet exhaust gases is that much less. However, if no bypass is installed then that solution is not available to solve chloride cycle problems. Because the melting point of chlorides is so low they condense higher up the preheater. This means that the amount of chloride exiting the preheater in the dust to the external cycle can be as high as the total inputs in the feed and fuel. Purging some of the dust and interrupting the external cycle can then be sufficient to avoid preheater blockages. As much chloride can be purged in the dust as is entering the kiln, of course there is then the problem of disposing of the purged dust. This solution is more applicable to grate preheater and 1 or 2 stage preheater kilns. A further solution to chloride problems can be to modify the material flow in the preheater creating “meal curtain” at the kiln inlet. Some cool material from the upper stages of the preheater is diverted to the kiln inlet. The chloride in the gas exiting the kiln condenses on the cool meal in the curtain. The chlorides are intercepted before they reach the preheater and therefore cannot cause blockages of the preheater. Bypasses and dust purges are much less effective as solutions to sulphate recirculation problems. Sulphur inputs to cement kilns are significantly higher than chloride inputs. The volatility of sulphates is not as high as chlorides so the concentration factor is not high enough for a bypass or dust purge to be effective. We will consider the chemistry of sulphates in the cement kiln in the next session of the course. We learned in the preceding session of the course that the volatility of the alkalis, K2O and Na2O, can be increased by the addition of calcium chloride, CaCl2, to the kiln feed. The alkalis, K2O and Na2O, will preferentially combine with chloride to form KCl and NaCl. 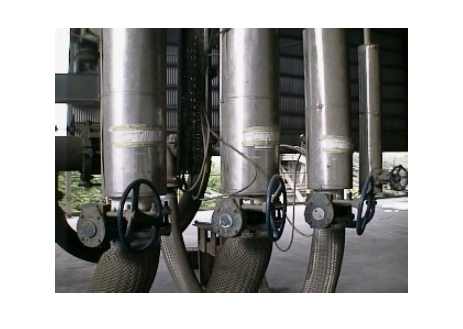 This technique can be used to produce low alkali clinker from high alkali raw materials provided that some of the volatilised alkali is extracted from the internal cycle through a bypass or from the external cycle via a dust purge. Conversely the volatility of the alkalis, K2O and Na2O, can be reduced by the combination with sulphate, SO3. This sulphate, SO3, can be provided through the fuels used to fire the kiln, or by the addition of sulphate, usually as calcium sulphate, CaSO4, to the kiln feed. Alkali sulphates, K2SO4 and Na2SO4, are only sparingly volatile in the burning zone and will pass out in the clinker, provided that oxidising conditions are maintained in the kiln. Any alkalis present as carbonates will be highly volatile and build up into heavy cycles. This can be alleviated by the addition of gypsum, CaSO4.2H2O, to the kiln feed to balance the alkalis with sulphate, anhydrite, CaSO4, is preferable to gypsum as it does not contain water of crystallisation that must be driven off in the preheater. The alkalis are then combined with sulphate and pass out of the kiln in the clinker. However, the sulphur burden on cement kilns is generally rising with use of alternative fuels and particularly petroleum coke. Additions of sulphate to kiln feed is not required in these cases. The pressing need is to combine the excess sulphur with alkalis as sulphates, K2SO4 and Na2SO4, either by reducing sulphur inputs to balance the alkalis and combine as alkalis sulphates, or by increasing alkali content with higher alkali clays or feldspars to balance the sulphur inputs. If the sulphate is in excess of the alkalis then calcium sulphate will be formed, which breaks down in the rotary section of the kiln liberating lime, CaO, and sulphur dioxide, SO2. The volatilised SO2 reacts with CaO and alkalis to form sulphates in the preheater, which are then carried back into the kiln with the hot meal, building up in a sulphate cycle. As we saw in the previous session the chloride content of clinker will be minimal, as the process cannot tolerate high chloride inputs. However, the chloride content of the hot meal can be ~100x the inputs to the kiln and has a significant effect on the alkali:sulphate ratio in the hot meal. In the hot meal potassium will preferentially be combined as chloride, KCl. Any excess chloride over and above the potassium will combine with sodium as NaCl. Any excess chloride over and above the potassium and sodium will combine as calcium chloride, CaCl2. Potassium is usually in excess of chloride and then combines with sulphate as K2SO4, in that case the sodium will also be combined with sulphate as Na2SO4, or the double salt, K3Na(SO4)2. Alkalis in excess of sulphates will enter solid solution in the clinker minerals, a slight excess of alkalis over sulphates is the ideal scenario meaning an alkali:sulphate ratio of ~1.2. Sulphate in excess of alkalis will form CaSO4, which leads to the problems with sulphate cycles, alkali:sulphate ratio below ~0.8 is likely to lead to kiln operational problems. 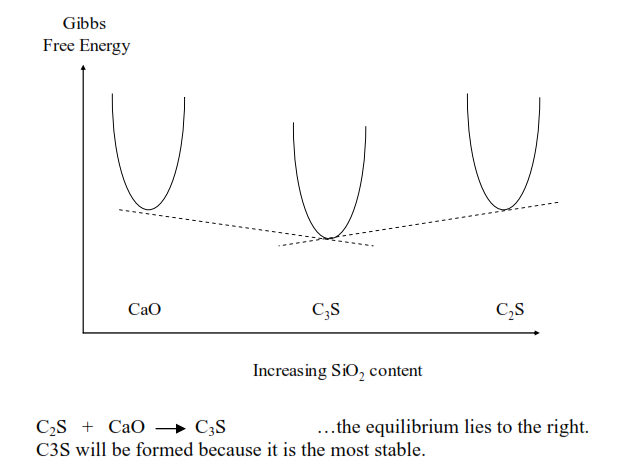 Local oxygen deficiency and/or incipient reducing conditions shift the equilibrium towards the decomposition products. This reaction will take place at 1000~1100°C which can be attained in the kiln inlet. Whole motor tyre burning inevitably leads to local oxygen deficiency in the kiln inlet, if CaSO4 is present then heavy sulphate cycling is likely to result. Incipient reducing conditions can often be traced to the main burner of the kiln. Low NOx burners are designed to operate under incipient reducing conditions to degrade NOx formation. If sulphate is in excess of alkalis in hot meal then heavy sulphate cycles are likely to result. These problems frequently arise when the switch is made to high sulphur fuels, the burner that was OK for low sulphur fuels creates problems with higher sulphur fuels. 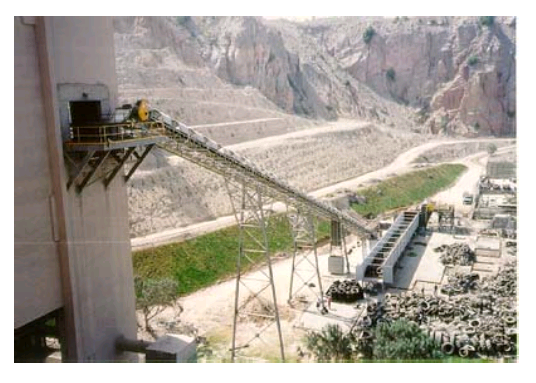 Potential problems might be: Preheater blockages, ring formations in the kiln inlet, clinker ball formation, high free lime clinker, high dust recirculation from kiln to cooler. Sulphate excess creates problems in preheaters due to the formation of very hard CaSO4 based coating, alkali sulphate based coating is relatively soft, while calcium sulphate coating is very hard and dense. Calcium sulphate, CaSO4, in the hot meal can also lead to the formation of the intermediate compound, sulphate spurrite, 2C2S.CaSO4. Sulphate spurrite formation is a prime cause of ring formations at the back of the kiln and spillage of hot meal back through the kiln inlet seals, it is also one of the causes of the massive clinker ball formation that can arise with heavy sulphur cycles in the kiln. Anecdotally these clinker balls can reach up to 4m in diameter and roll through to the burning zone and get stuck under the burner. In some cases they have been found to have a hard shell and be filled with uncombined material when broken. Formation of these clinker balls is associated with heavy sulphur cycles on some kilns, but is not a phenomena that is only associated with sulphate cycling, similar problems have been encountered with abnormally high MgO and Mn2O3 content of kiln feed. These episodes illustrate the complex and unpredictable affects that changes in the amount of flux, properties of the flux and “clinkering range” in the kiln can have. Similarly unpredictable is the formation of “snowmen” in clinker coolers. Again this can be associated with high sulphate recirculation in the kiln, but any changes in the flux content and properties may cause the formation of snowmen. Snowman formation arises from the clinker falling into the cooler containing some residual liquid phases or flux. This provides the conditions for fine clinker dust blown from the cooler bed to stick together and form the snowman. The snowman problem has become more acute with modern direct aerated coolers and the associated higher energy recovery and secondary air temperature involved. Sulphates in the clinker melt cause a reduction in the viscosity and surface tension of the flux. This reduces the adhesion forces in the clinker nodules and leads to smaller clinker particle size distribution. In turn this can lead to high dust recirculation from the clinker cooler to the kiln. Heat transfer from the flame to the kiln charge is impaired, the dust falls out of the kiln gases in the kiln and is reheated to the clinkering temperature as it passes back through the burning zone in the kiln charge material. Ultimately the kiln cools below the temperature of C3S formation and the kiln has to be stopped to run the dust out of the kiln. The decomposition is also dependent on temperature and residence time in the kiln at the elevated temperature. Combination temperature and kiln rotational speed can therefore affect the intensity of sulphate cycles. The decomposition can also take place so late in the process that the CaO liberated cannot be combined with C2S to form C3S and high free lime clinker results. In session 1.6 we discussed mineralisation in general and the specific, patented technology applied at Aalborg. This certainly means that sulphate is present in excess of alkalis. The aim is to ensure the presence of calcium sulphate in the clinker in the form of the double salt, calcium langbeinite, 2CaSO4.K2SO4. Steps have to be taken to prevent the breakdown of calcium sulphates in the kiln. Burning zone temperature must be reduced, as enabled by the fluoride mineralization, sufficient oxygen excess must be provided to avoid incipient reducing conditions. As previously stated the main aim of the Aalborg technology is to improve the quality of the clinker. That will be the topic of module 2 of the course when we will again return to the Aalborg technology. In the remaining session of this module 1 of the course, we will attempt to determine how much additional clinker productivity can be achieved by reduced thermal energy consumption. In the introduction to module 1 we saw that efficient, modern cement kilns achieve thermal energy consumption of less than 3000 kJ/kg of clinker produced. Higher thermal energy consumption of a cement kiln almost inevitably leads to lower clinker productivity. With higher fuel consumption the volume of exhaust gases to be vented from the kiln rises. In this final session of Module 1 of the course we will calculate the volume of kiln exhaust gases, and assess the productivity benefit of lower thermal energy consumption. These oxygen corrections are very important, high oxygen fuels (alcohols, etc.) require less combustion air and generate lower combustion product volumes. Although from DuLong’s formula we know that oxygen reduces the calorific value of the fuel as it is partially oxidised. We should also correct for the excess air that is drawn into the kiln, but will work on zero excess for the purposes of this model. Using this model we can find out that reducing the kiln thermal energy consumption by 100 kJ/kg clinker, or 3.17%, will reduce the volume of exhaust gases to 1.232 Nm3/kg clinker or 2.5%. This is the increased output we could expect to be able to achieve by that energy saving. Each 1% saving in kiln thermal energy consumption can be translated into 0.79% clinker output increase, provided that venting the exhaust gases from the kiln is the constraint on clinker output. This brings us to the end of Module 1 of our cement kiln chemistry course. In Module 2 we will switch our focus to the quality of the clinker produced from the kiln.